These two marvels of God's creation are included not only to display God's incredible designs in His creatures, but also to acquaint you more fully with the type of information you can glean from the creationist magazine, Creation Ex Nihilo. The following are articles in Creation Ex Nihilo magazine Vol. 14, No. 4 of September - November 1992 (published by Creation Science Foundation Ltd., P.O. Box 302, Sunnybank, QLD, 4109, Australia), by Robert Kofahl, Ph.D., and Tom Wagner. In my opinion every family should subscribe to Creation Ex Nihilo! Dr. Robert Kofahl teaches us about the gecko lizard on page 6. "A Lizard on Your Ceiling"
"The gecko lizard can walk across your ceiling upside down without falling off. How does it do this? Until a few years ago scientists did not know, though they proposed several conflicting theories. Examination of the toe-pads of the gecko with optical microscopes at up to 2,000 diameters magnification revealed thousands of little fibres arranged like the tufts of bristles in a toothbrush. Yet the question remained unanswered. An answer was finally provided by the powerful scanning electron microscope, which was able to take a series of remarkable photographs magnified to 35,000 diameters and more. What was revealed? The gecko has on its toe pads many millions of fine fibres tipped with little suction cups, each about eight millionths of an inch in diameter. In conjunction with this, the lizard's feet are designed so that the tips of the toes bend or curl upward so that he can peel off the suction cups gradually at each step and not get himself too firmly stuck to the surface. It is estimated that the gecko has at least 500 million suction cups on his toes. The extraordinary microscopic structure of the gecko lizard's toe pads clearly indicates intelligent purposeful design. 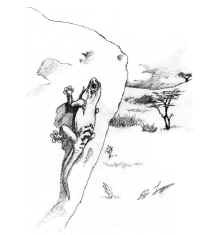 No remotely plausible scheme for the origin of the gecko's suction cups by random mutations and natural selection has yet been proposed by evolutionary theorists. And should some scientist with a clever imagination succeed in devising such a scheme, he would still be without a scrap of fossil evidence to demonstrate that the hypothetical process of evolution actually took place in the past." "-- You can't see with the naked eye the tiny suction cups on a gecko's foot. But each chevron-shaped ridge on the gecko's amazing foot pad is composed of millions of fibres tipped with microscopic suction cups. This allows it to walk upside down across your ceiling, or sideways across your wall --." With such marvelous evidence of a designer, how can anyone doubt the existence of God? 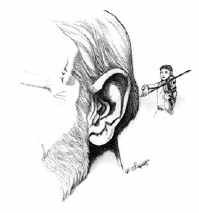 "Your Hearing: A powerful pointer to God's creation"
"Contemplation of the size of things that have been created can be a very effective tool in comprehending the greatness of God. For example, consider the Creator's technical ability in a study of human hearing. The ability of our ears to detect sound is much greater than the minimum expected requirement for survival had man simply evolved. To visually grasp the incredible sensitivity Lipscomb describes, imagine what it would be like to watch a six-foot man, standing on the surface of the earth, shrink to only one one-hundred-millionth of an inch. The earth, shrinking also - but still enormous when compared to the man - would proportionately reduce to a tiny ball no bigger than the small letter 'o' on this page! The man would become utterly invisible, even to the powerful microscopes of today. So praise be to God for what He has done!"